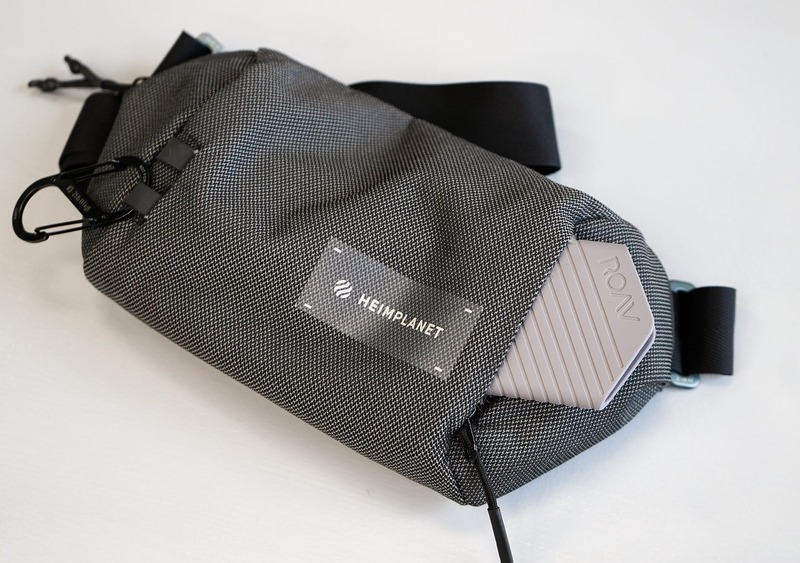 The Heimplanet Transit Line Sling might just be the perfect personal item for flying. We’ve tested it rigorously, and have little to complain about. 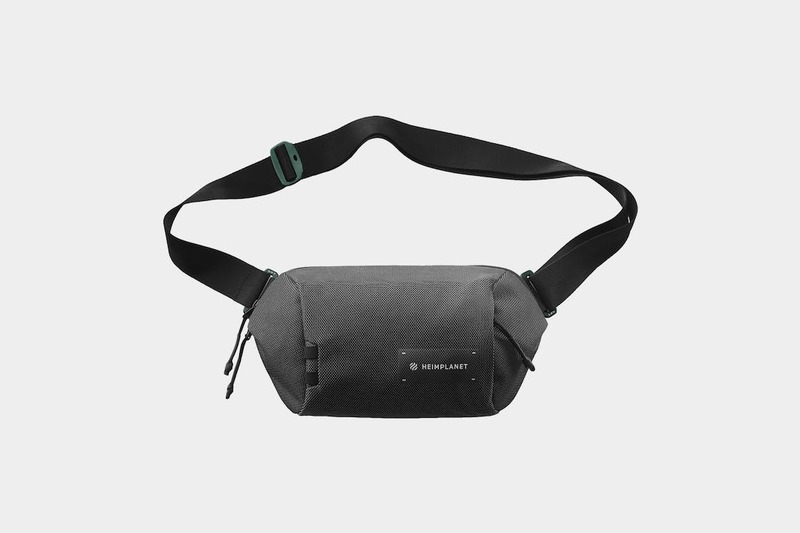 The Heimplanet Transit Line Sling Pocket is a one-liter sling that is perfect for carrying everyday items and in-flight essentials. 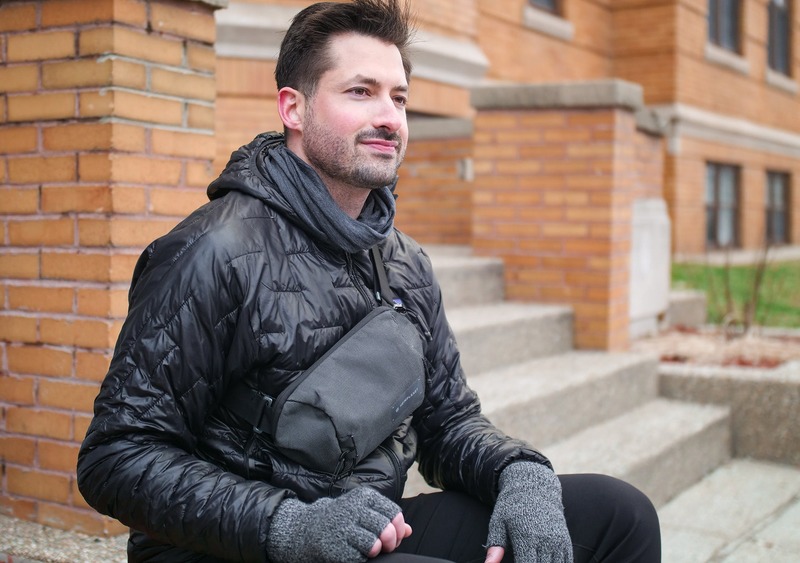 We’ve actually been testing this sling for about nine months at the time of this review, which should give you a little hint about how we feel about it. Let’s check it out. 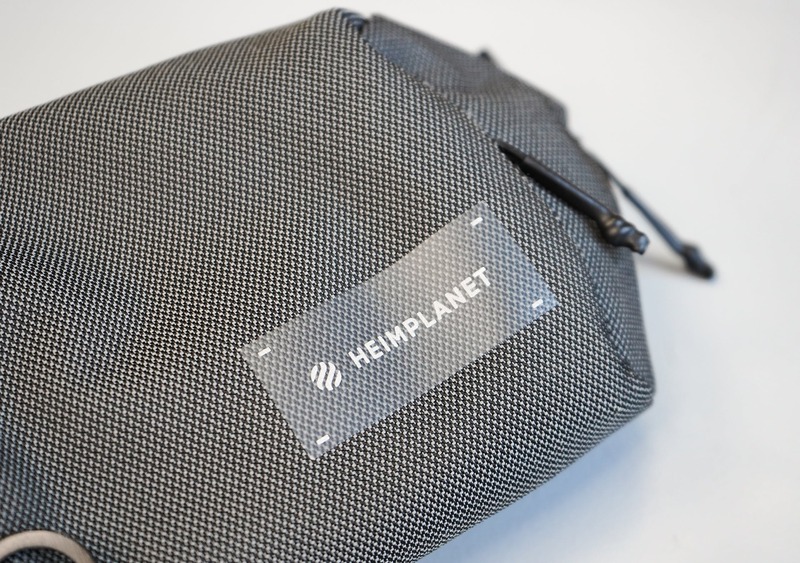 From a branding perspective, there is a large sticker on the outside with HEIMPLANET in all caps, and a small logo next to the name. We like the look of the text and the logo, but this “sticker” does look and feel kind of cheap. It almost looks like a piece of clear tape was just slapped on there, if we’re being honest. We are, however, pretty sure that it’s been attached with some sort of heat-activated glue—so it should be quite a bit more secure than your average tape. 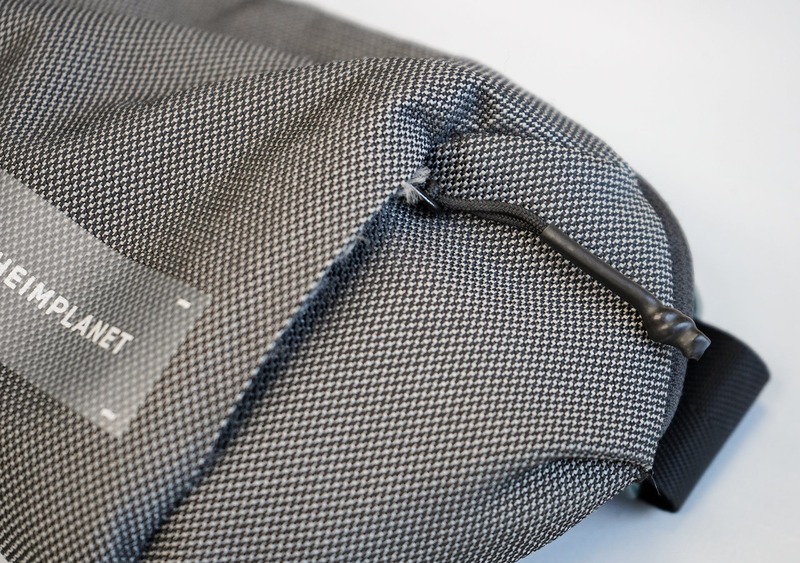 The main fabrics on this sling are an 800D nylon and a 660D polypropylene DYECOSHELL. And if you remember how we mentioned there are two different colored fabrics that make up the Castlerock Gray—well, these are the two fabrics. The DYECOSHELL is also “dope-dyed,” which means less dye is used compared to traditional methods. This makes the sling a bit more sustainable, which we love. Overall, these two fabrics have come together to create an interesting feel. The polypropylene adds a tiny bit of rubberiness to the feel, but not too much to where it feels cheap. The nylon gives it a good bit of rigidity and makes it feel really “solid” in your hand. It definitely feels like tough stuff. 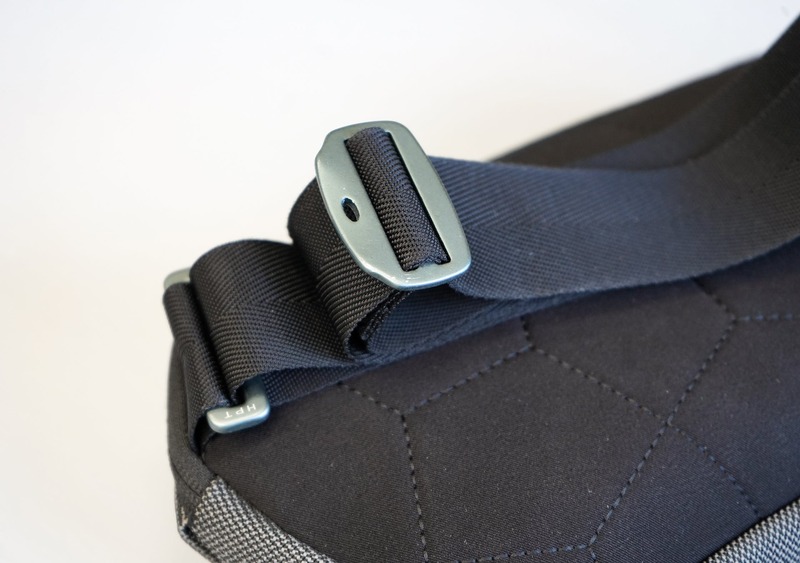 On the back of the sling, there is a slightly padded back panel—or maybe you could call it a “chest panel” if you’re wearing this thing on the front of your body? 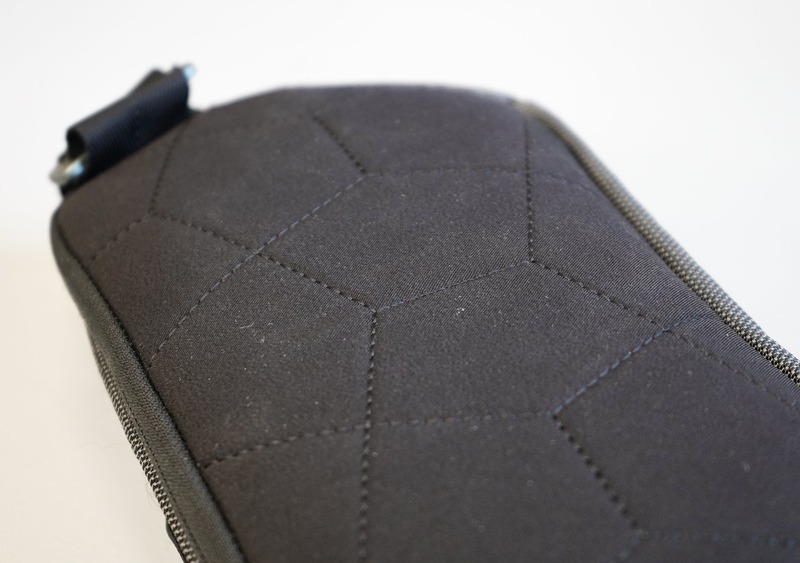 Either way, it’s got this funky hexagon sort of pattern we’ve seen on a couple of Heimplanet’s other products, which we like. The lining inside the sling is polyester, and it contains hints of that same pattern that is on the back—chest?—panel. It’s a nice, subtle branding element from Heimplanet, and we think it ties everything together quite nicely. 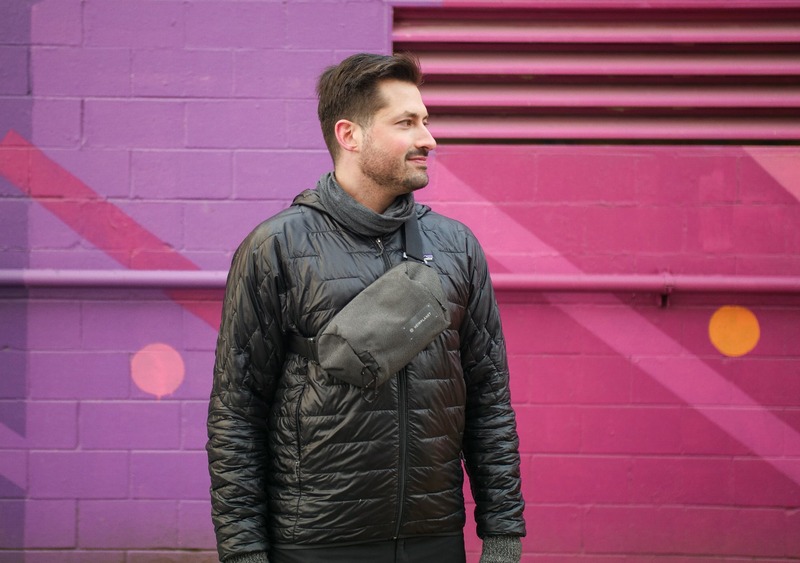 To wrap up the materials, there are some reverse coil weather-resistant YKK zippers on the outside of the sling, as well as on the small pocket on the inside. These reverse coil zippers help with weather resistance, and they also look a little bit cleaner than your average zipper, since there is a layer of fabric above the zipper teeth. We like that. The paracord zipper pulls are also a nice touch. There is some lightweight aluminum hardware that is used for adjusting the sling strap as well as attaching the strap to the sling itself. We always love to see metal used in favor of plastic, and this is no exception—in theory, these adjusters should pretty much last a lifetime. And lastly, there is a nice layer of EVA foam on the back—chest?—panel which adds a little bit of padding to give it a more comfortable carry. Overall, the materials on this sling are solid and they’ve held up quite well during nine months of heavy, daily testing. So, let’s address the carry of this thing before we dive into the details. This sling is worn cross body-style, and it can be worn either on the front or the back of the wearer. 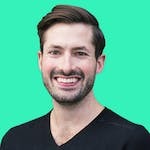 Overall, it’s a nice, comfortable fit, but we have noticed the strap can sort of creep up close to your neck with prolonged usage. This is especially true if there is heavy gear inside. We’ve noticed that some slings account for this by swapping the anchor points on each side and positioning them a bit differently. 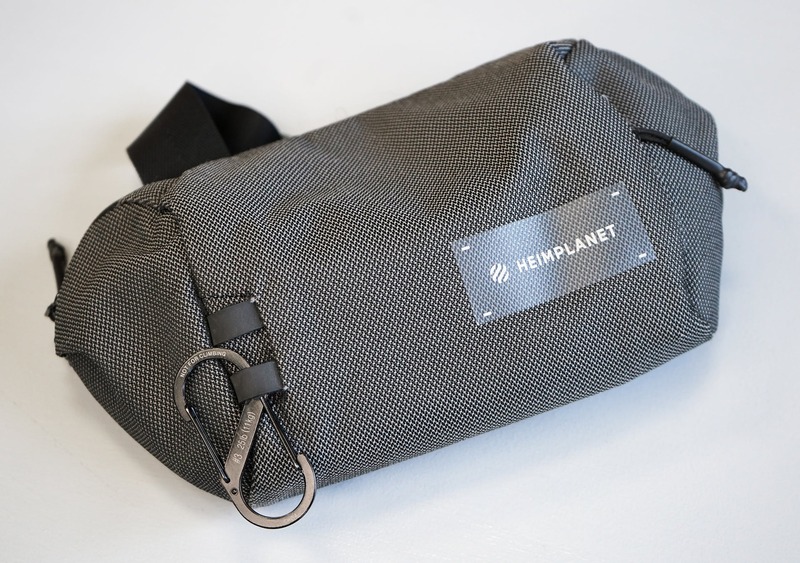 In this case, we think Heimplanet kept it simple because the sling is just so darn small. It’s really a minor nitpick, but you will probably notice it if you’re carrying heavy gear around for long periods of time. We should also note that the strap is easily adjustable via the aluminum hardware, so even if you are having trouble with it moving around, you’ll be able to fix it pretty quickly and easily. Getting into the actual exterior components, there are two small lash tabs on the side, opposite the logo. These are handy to attach a carabiner to—we’ve been using the Nite Ize #3 S-Biner here, which is great for hanging on the seat in front of you on the plane, in a dirty bathroom, or wherever you may find yourself. Moving on to the inside of this bad boy, let’s kick it off with the small external pocket. Although you can fit a plus-sized iPhone inside, it’s quite snug and makes the shape of the sling a little bit awkward. 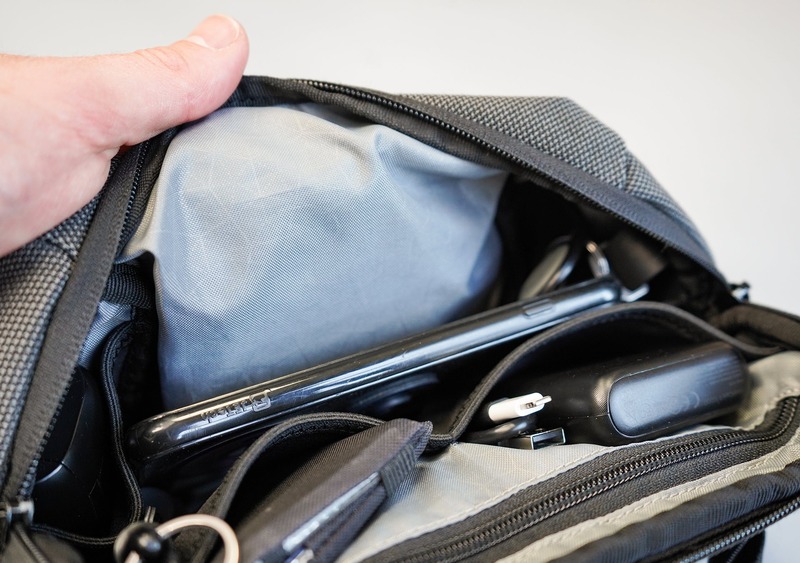 Smaller phones will do just fine, and this is an especially good pocket for other fragile items or items with screens/lenses, since the liner here is a lot softer than the liner on the interior of the main compartment. We’ve been tossing in the ROAV Franklin Sunglasses here—which are a pair of packable sunglasses!—and they fit quite nicely. That being said, you don’t need to have packable sunglasses for this pocket. We’re pretty confident that any sunglasses you have will work fine. The main compartment opens up horseshoe-style, giving you plenty of space to access all the nooks and crannies in this area. 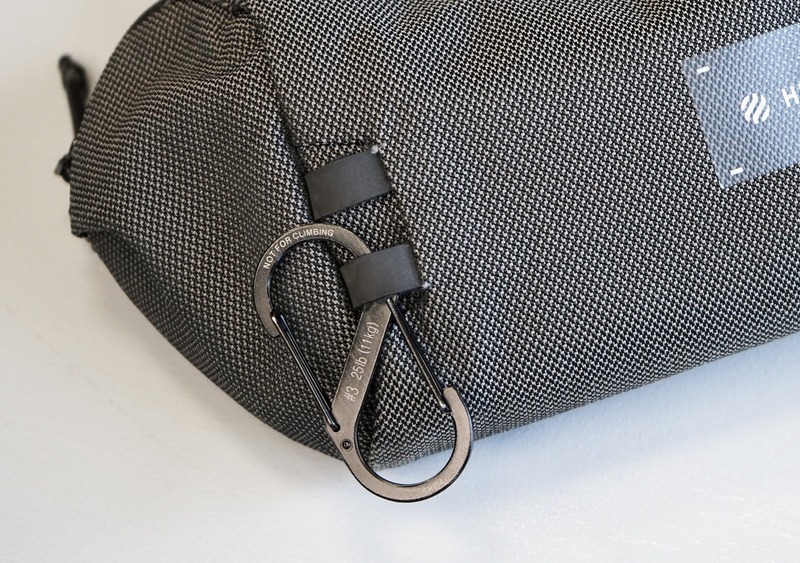 Inside, there are two stretchy mesh-like pockets in the front corners of the sling, which we’ve been using to store earbuds and the Orbitkey Key Organizer. 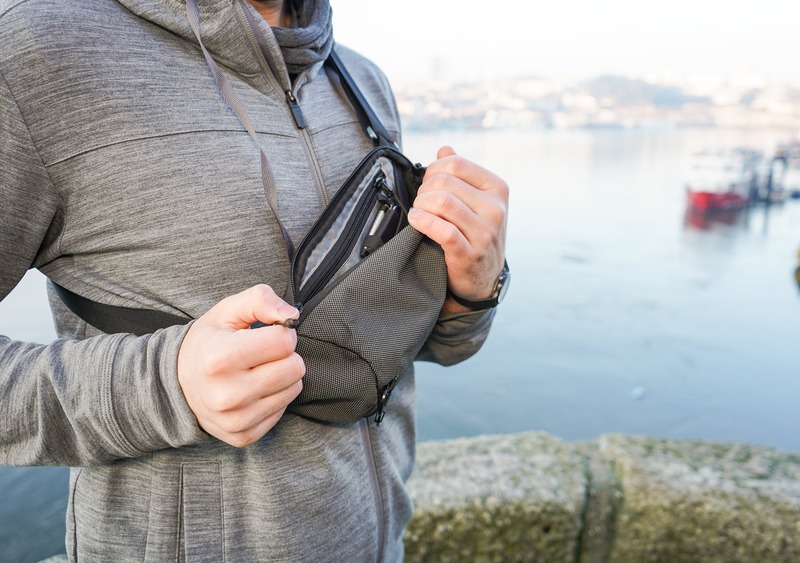 These little pockets are great for keeping the corners of the sling organized, and we love how they keep stuff from moving around as we’re wearing the sling. Towards the back of the sling, there are two more stretchy mesh divider pockets. One fits the Anker Powercore II 10000, as well as a smaller micro-USB cable for charging devices when you’re out and about. We’ve found the other side works quite well for a wallet, and in our case, we’ve been using the Tom Bihn Nik’s Minimalist Wallet. And lastly, there is a zippered pocket towards the back of the sling (near the back panel) for storing flatter items. This is a great place to store your passport as you’re cruising through the airport, and we’ve been tossing ours in here with the Bellroy Passport Sleeve. We also have a small Field Notes notebook for taking, well, notes. Obviously, you could put any number of items in here, but if you’re traveling internationally and using this as your personal item—the passport is a no-brainer. Having some rigid items in here also helps the sling retain some of its shape, as well. 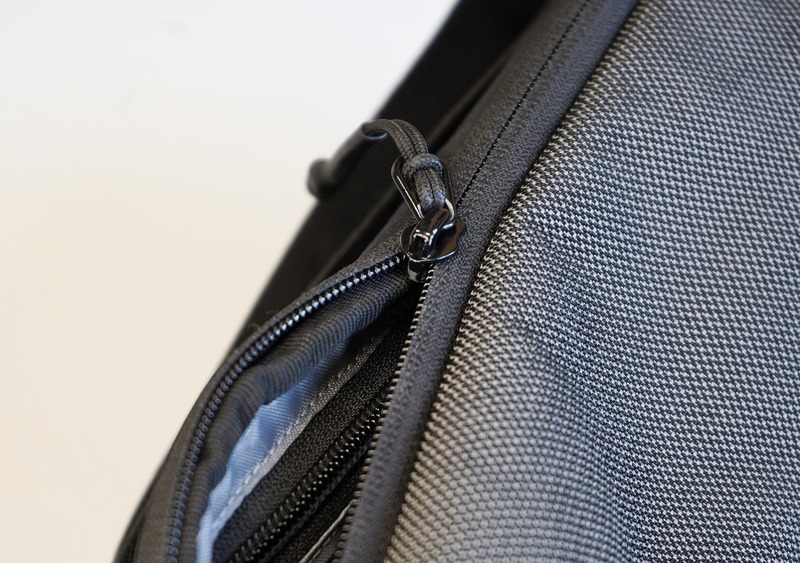 We should also note that we did a bit of “hacking” here, by removing the paracord zipper pull on this internal pocket. We’ve attached the Prometheus Lights Kappa Quick Release Keychain, which is just a fancy way of saying, “a keychain that is super easy to remove.” On that, we’ve got some Matador Earplugs and the Gerber Shard, which is a really small and useful multitool that is TSA-approved. 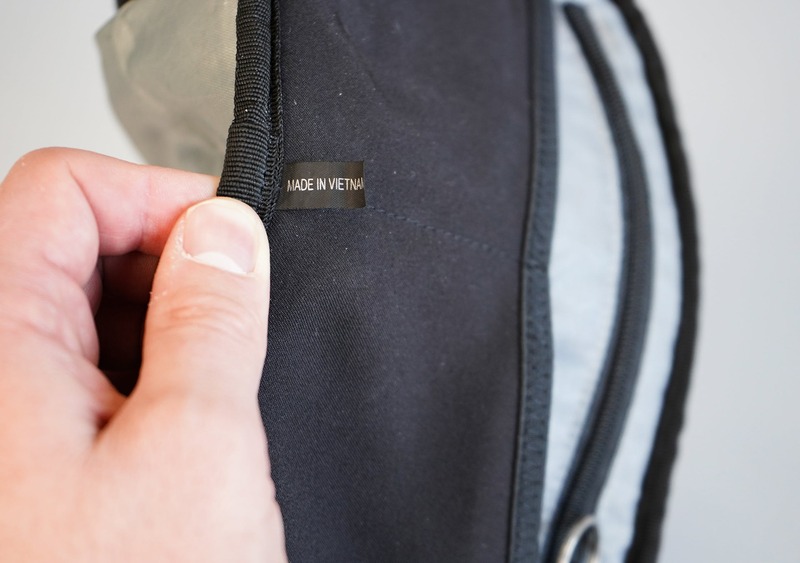 And the last thing we’ll point out is the small tag indicating that this sling has been made in Vietnam, which you can find in the bottom of the main liter-capacity of the sling. So, yeah. Thank you, wonderful people of Vietnam, for making such a nice sling! Overall, we think the internal organization on this sling is super well thought-out. 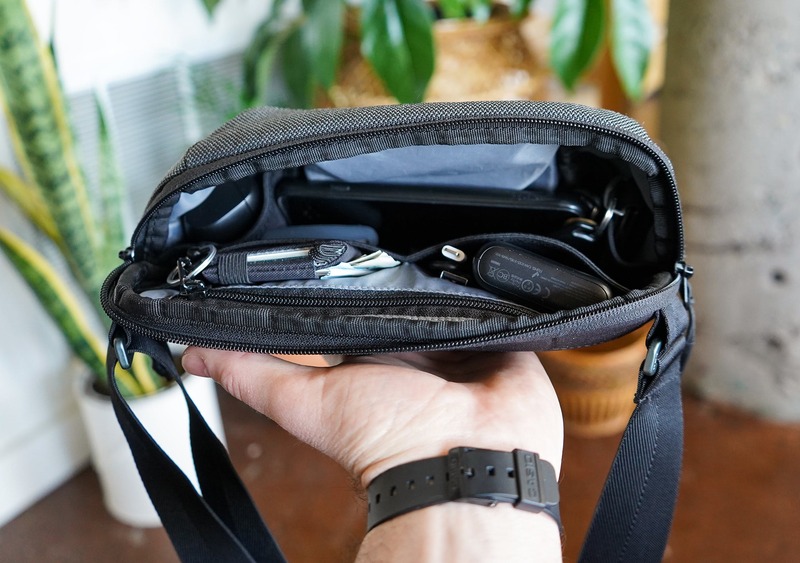 It’s got just enough where you can organize everything to your liking and make sure nothing is sliding around in transit, but it’s still got a clean look and you don’t have a million zippers and pockets to wade through. At the time of this review, we’ve been testing this sling for nine months. It has seen some very heavy use across Detroit, New York, Minneapolis, Porto, Budapest, and Amsterdam (we told you it’s seen heavy use). We’ve had it on flights, buses, taxis, long walks on the beach, and pretty much everything in between. Other than some frayed edges near the small zipper, as well as two small frayed areas near the lash straps, this sling has been holding up really well. We think the fraying isn’t much to worry about—we’ll chalk it up to general wear and tear, considering how rigorously we’ve been testing this. We’re also pretty sure we could burn off the frayed bits with a lighter, but of course, we had to keep them on to show you what’s been happening. Really, the only major con is that sometimes the sling can feel a bit imbalanced when you’re wearing it. However, that is easily mitigated by either adjusting the shoulder strap or moving the sling from front to back on your body. We do also wish some more thought was put into that sticker on the front. Other than that, this has been a solid companion during our travels and at home—and we don’t see that stopping any time soon. Loving the feel of these materials and the organization this sling offers. This has been a joy to use, and we’ve already put it through some rigorous testing. Still going strong, although we have noticed the carry can be a bit imbalanced sometimes. This little sling makes for a great personal item on flights. No durability issues to note yet. Starting to see a bit of fraying. Seems like general wear and tear at this point. Fraying has gotten worse, but other than that, no major durability issues. Still loving this sling. 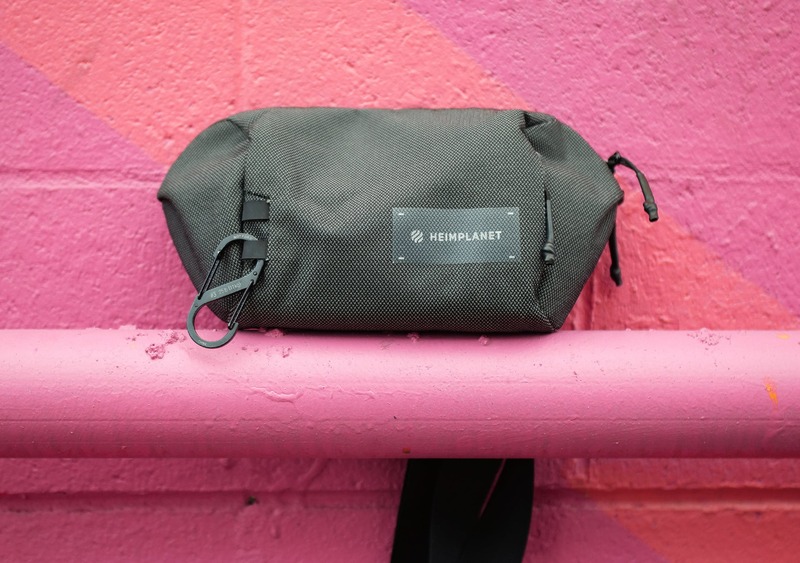 The Heimplanet Transit Line Sling Pocket offers just the right amount of organization in a small, easy-to-use package. We think the size is just right for carrying a few necessities around with you during the day or for using as a personal item on the plane. 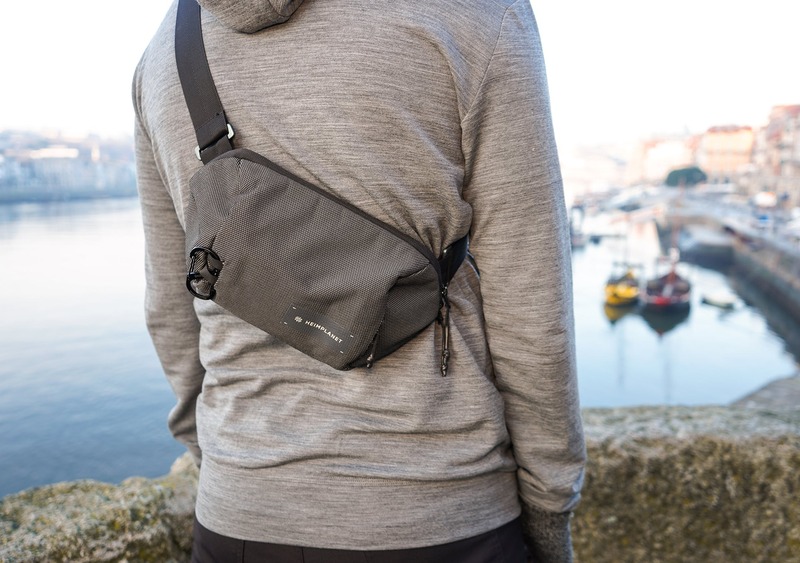 While there has been some ordinary wear and tear in the fabric, and the carry is sometimes a bit imbalanced, the benefits of this sling cannot be understated. This thing has been a joy to use, day in and day out—and we don’t expect that to change anytime soon.